The longest day of the year didn’t feel especially long here in Iceland. Because it is light through the night anyway and also cloudy a lot of the time, it is hard to tell when the sun is setting or rising. It gets darker here but there is no definite “night” like what I am used to in the U.S. where the line between night and day is as clear as the darkness. Everyday has felt like it brought with it a midnight sun but the solstice was still a noteworthy day here. 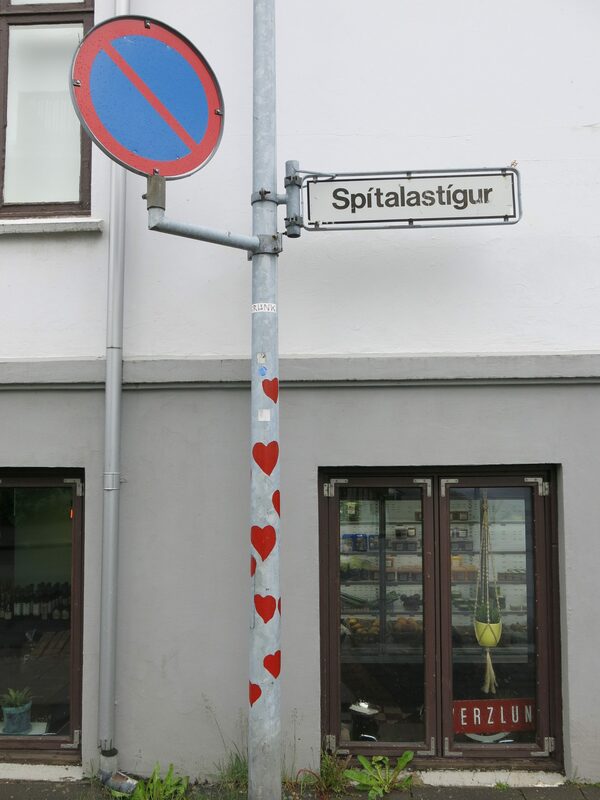 Some of us spent the day ticking off Reykjavik’s many art museums; going from contemporary to modern to sculpture to traditional or any combination thereof. 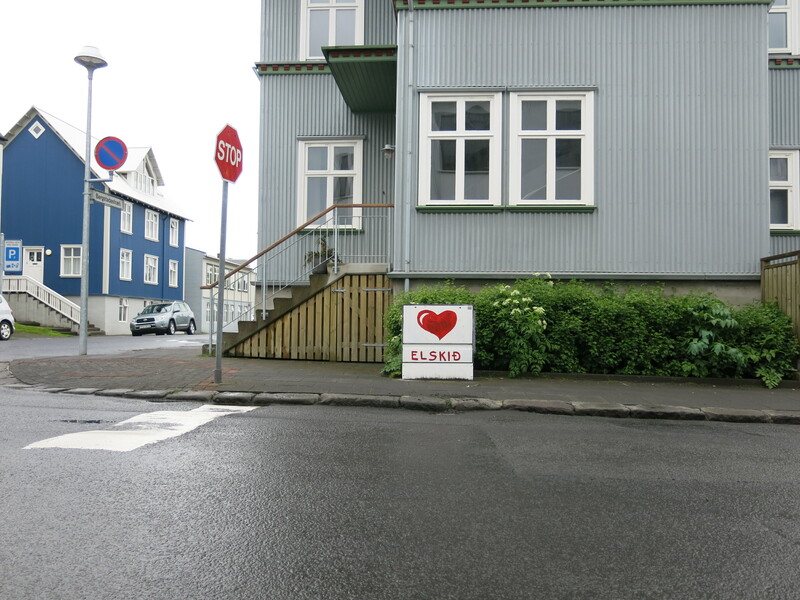 Icelanders seem to be very nice people which has taken me aback many times as cars actually stop and wave you across the street even if you aren’t at a crosswalk. Some of us found that they even give away free books! An Art Museum next to our hostel had boxes filled with cool books they were giving away so some of us were able to update our collections. Others spent time perusing the city streets taking in the art and going shopping sometimes putting a little thrift into it. A notable moment of the day was when Croatia upset Argentina 3-0 in the football World Cup. Which went against most predictions. 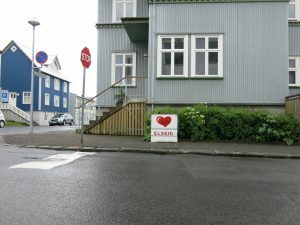 This may have been mentioned before but the 2008 economic crash also affected Iceland. Some would say it was worse here than in the U.S. 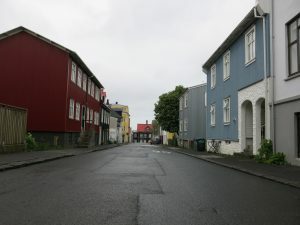 The Icelandic parliament decided to try to pull itself out of the meltdown and not take very much help from the International Monetary Fund. This marked a period where national solidarity and support was a necessity. Remnants of that period in Icelandic history is still very visible today. The visual symbol used to represent and encourage this morale and solidarity at the time was a red heart. Walking around Reykjavík the heart appears in street art all over the city. A warm reminder of how resilient this tiny country can be. To mark the day of midnight sun a 5k, 10k, and half marathon were put on in order to commemorate the symbolic date. More than 1600 people registered with about 1000 of those being tourists including myself, Kellen, Faith and Andy. Many people even flew in just for the solstice run. We met up with the sister of an Earlham alum who was looking to get out of the country and do something fun for the solstice so ended up flying in the night before the run from San Francisco, CA. The Earlham team ran the course in pretty good time and ended with a long relaxing soak in the geothermal pool right next to the end of the run. Iceland takes their pools to a whole new level. The water is geothermally heated and because the weather is pretty cool here the pools are kept warm. There are also varying levels of hot-tubs as well as an ice-barrel that you can plunge into. Needless to say it was the perfect end to a midnight run. Today also marked the beginning of the end as it was our last full day in Iceland. Tomorrow we will be packing all our stuff and flying home. Apart from walking running and sightseeing, today also offered a space for some reflection as we had our last dinner meeting of the trip. This has been a time where we all come together, eat good food, make announcements, talk about what people have done or are going to do the next day and also do cheers and jeers where we acknowledge things which merit praise or bring up points of contention or discussion or things we want to change. Tonight we heard cheers for the group getting along so well, to the weather for showing us benevolent sunshine more often than not, for everybody who cooked dinners over the trip, for Charlie who was the catalyst for Icelandic Field Studies about 6 years ago, and for the Scantlands who have helped fund this trip along with all the other EPIC adventures. Personally I am grateful for the optimism and hope this tiny and beautifully barren country has given me. When Leaving Skalanes, Olí described to us the shift he has been observing over the past 13 years. Not a shift towards increasing environmental degradation and decreasing biodiversity as species are driven to extinction which we have become so used to seeing and hearing. 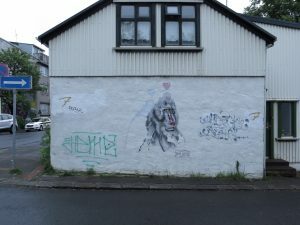 But a shift towards the other end of the spectrum where species are thriving, where more fish and whales are coming into the Fjord and the bird populations are increasing. Even in the preliminary data we have gathered, although we haven’t fully analyzed it, is making me think that the highly invasive Lupin that is ravaging the Icelandic landscape may not be be threatening the terns and the pollinators as much as we thought it might. Even in regards to the country as a whole, it uses almost 100% renewable energy and is actively working to improve its emissions. This paints a picture that the world may not be falling into ruin as quickly as I thought it was before I came here. And that the global changes we are seeing may have a reciprocal nature in places like Skalanes, that if we look close enough, we can find faint glimmers of resistance to the tailspin narrative of global degradation. So with that, cheers to Iceland!